Climate sensitivity- lowering the IPCC "fat tail" | Watts Up With That? Climate sensitivity- lowering the IPCC "fat tail"
There is word circulating that a paper soon to appear in Science magazine concludes that the climate sensitivity—how much the earth’s average temperature will rise as a result of a doubling of the atmospheric concentration of carbon dioxide—likely (that is, with a 66% probability) lies in the range 1.7°C to 2.6°C, with a median value of 2.3°C. This is a sizeable contraction and reduction from the estimates of the climate sensitivity given by the Intergovernmental Panel on Climate Change (IPCC) Fourth Assessment Report (AR4), in which the likely range is given as 2.0°C to 4.5°C, with a best estimate of 3.0°C. Contrast that with the IPCC assessment of the literature (summarized in our Figure 1) which routinely includes studies concluding there is a greater than a 10% possibility that the true climate sensitivity exceeds 6°C and some which find that there is a greater than 5% possibility that it exceeds 10°C. Figure 1. Climate sensitivity distributions retained (and in some cases recast) by the IPCC from their assessment of the literature. Note the “fat tail” towards the right which indicates the possibilities of the climate sensitivity having a very large positive value (that is, a huge degree of global temperature rise for a doubling of the atmospheric carbon dioxide concentration) (source: IPCC AR4). Assessing impacts of future anthropogenic carbon emissions is currently impeded by uncertainties in our knowledge of equilibrium climate sensitivity to atmospheric carbon dioxide doubling. Previous studies suggest 3 K as best estimate, 2–4.5 K as the 66% probability range, and non-zero probabilities for much higher values, the latter implying a small but significant chance of high-impact climate changes that would be difficult to avoid. Here, combining extensive sea and land surface temperature reconstructions from the Last Glacial Maximum with climate model simulations we estimate a lower median (2.3 K) and reduced uncertainty (1.7–2.6 K 66% probability). Assuming paleoclimatic constraints apply to the future as predicted by our model, these results imply lower probability of imminent extreme climatic change than previously thought. Figure 2 shows the distribution of the range of the earth’s probable climate sensitivity as determined by Schmittner et al. Note the rapid drop-off in the probability that the climate sensitivity is much greater than 3°C (the IPCC “best estimate” for the sensitivity), and that the distribution falls off less slowly towards the left (towards lower sensitivity) than towards the right (higher sensitivities). The “fat right-hand tail” of the distribution is gone and the possibility that the climate sensitivity is in the 1°C to 2°C range is not minimal. Figure 2. Distribution of the land/ocean climate sensitivity as determined by Schmittner et al. (adapted from Schmittner et al., 2011). The Schmittner et al. results join a growing number of papers published in recent years which, by employing investigations of the earth’s paleoclimate behavior (that is, how the earth’s temperature changes in the past when subject to changing climate forcings) have come to somewhat similar conclusions, especially regarding the (lack of) evidence to support the existence of the fat right-hand tail. When instead reasonable assumptions are made, much greater confidence in a moderate value for [the climate sensitivity] is easily justified, with an upper 95% probability limit for [the sensitivity] easily shown to lie close to 4°C, and certainly well below 6°C. These results also impact strongly on projected economic losses due to climate change. Annan made repeated comments during the IPCC AR4 review process that the IPCC’s handling of climate sensitivity and its probability distributions were incorrect. His complaints largely fell upon deaf ears. That said, [the Schmittner et al. paper] is a useful antidote to the exaggerated uncertainty estimates that have been prevalent over recent years, and I certainly applaud the intentions and effort underlying this substantial piece of work. In any case, I expect the merchants of doubt to do their worst on it when they cite it in the IPCC report. But, as the evidence mounts against a high value for the climate sensitivity, and evidence grows for a low value (recall that the observed rate of global warming for the past several decades has fallen well below IPCC best estimates), the IPCC is going to be hard-pressed to retain the status quo in its Fifth Assessment Report, especially in light of the enhanced scrutiny that its AR4 misdeeds brought upon the process. But, as James alludes to, perhaps we ought not be holding our breath. And, for those keeping score out there, about 10 years ago, a couple of us here at WCR were part of a team which published a paper in the journal Climate Research in which we employed a variety of techniques to derive empirical estimates of the amount of temperature rise that we could expect by the end of this century—a rise that could pretty well be considered to be in-line with the climate sensitivity. We concluded that the expected temperature rise between 1990 and 2100 would be in the range 1.0°C to 3.0°C with our best guess being 1.8°C (in contrast to the IPCC estimates, which, at the time, were for a rise of between 1.4°C and 5.8°C). Michaels, P.J., P.C. Knappenberger, O.W. Frauenfeld, and R.E. Davis, 2002. Revised 21st century temperature projections. Climate Research, 23, 1-9. I guess we’ll have to wait to see how they come to this number, but it doesn’t sound like there’s much in the way of negative ‘feedback’ from water/clouds. It’s a nod in the literature in the direction of something at least sane, I suppose, but I hope certain quarters won’t be expecting this to be some sort of compromise figure that all reasonable people can settle on as a basis for CO2 control policy. Wow! If true this is real dynamite for us “luke-warmists”. We now have real amunition against the extreme alarmist views. If the past rising trend isn’t kept going projected drop in temperatures due to natural oscillations could be much greater. They left out the possibility that CO2 might have a cooling effect. Still working from the old assumptions using models that don’t work. But thanks for your input fellas. Five stages of death: Bargaining. The real debate is about ‘feedback;. Current predictions of climate catastrophe due to human influence all depend on the assumption of a positive feedback effect, such that adding a little more CO2 to the atmosphere will cause a runaway greenhouse effect. This is pure speculation. We have never witnessed such an effect in geological history although past temperatures have been much higher and CO2 levels have been much higher. This positive feedback, reflected in ‘climate sensitivity’, is not based on experiment nor observation. It remains an unfounded conjecture in conflict with all known observations. Some scientists believe that water vapour also produces a negative feedback because the increased albedo of the consequent extra cloud cover will reflect more solar radiation back to space. This may or not be the case, but what we do know is that about 8000 years ago, when temperatures were much hotter than now (up to 7 deg. Celsius hotter according to the IPCC Arctic Impact Assessment Report – Section 2.7), we saw no positive feedback, no runaway greenhouse effect and temperatures eventually fell. Estimates of climate sensitivity are pure speculation in conflict with all known observations. We have never seen a runaway greenhouse effect on this planet even though temperatures have been much higher and CO2 levels have been much higher in the past. The relative stability of our climate over millions of years suggests that if there is a climate feedback effect, it is a negative one. Unfortunately, in the field of climate prediction, Science based on careful observation and experiment has been replaced by computer modelling and speculation. Before you know it, they’ll be saying that whatever effect there is from greenhouse gases is too small to separate from the noise. In two years it will be reduced to maybe 0.5 to 1C, after that AGW will be dead and I hope half these clowns will be fired. I have my doubts about all that. It has no sense to say we are 0.6 deg C warmer than in pre-industrial times, assuming the whole warming was caused by CO2, and then we project the curve up to 2100. 1980 ties were comparable or even colder than 1900s, 1940s were almost as warm as 2000s, MWP was warmer than present, even most of the interglacial was warmer than present. Recent warm peak was caused by natural oceanic variations, maybe combined somehow with the Sun activity. Since the most sensitive /polar/ areas show no relation with CO2 rise at all, all that sensitivity guesswork is nonsense. Considering climate sensitivity is the very crux of the CO2 CAGW argument, this is a huge step forward, in the enabling, of useful discussion. Could we be seeing a merging of skeptical Vs warmist opinion?? Agree. But first it will be changed to varying dynamically between -1.0 to +1.0 (or so), dynamically, and then forgotten. The “clowns” you mention, will be science advisors for some president, or in the high echelons of the UN, governing some new scare. I am sure this has a lot to do with what has happened over the last several years. 1. What period of time must elapse before the time is significant with respect to climate trends or even the lack of any trends? 2. What must the slope be in order for the warming/cooling to be considered NOT significant? The sad thing is that its now way to late for any chance of ‘climate science ‘ to gain a reputation for being sensible , far to many lies , far to many chicken little calls and far to much religiosity for people to forget . Its not water under the bridge because there was so much water it washed the bridge away. Now its question of cleaning up the mess and building a new bridge . An interesting issue will be the prior (if any) used in the new assessment. Annan and Hargreaves were critical of the nature of this (and some adjustments made) by IPCC in their 2009 paper. Not so. From IPCC Report AR5, July 2015, para 2.7.1 3: “There have been estimates of a lower climate sensitivity (Schmitter et al 2011, …) but there are some ambiguities and they remain controversial.”. There is no other reference to it in the report. Sorry I can’t provide the link, I should have it in a few years’ time. Determining the CO2 climate sensitivity from the conditions of the Last Glacial Maximum depends completely/100% on what your assumptions/calculations are for how much additional solar radiation is reflected away from the Earth by all that extra glacial ice, snow, desert and grassland and other changes in clouds and dust for example. Climate science consistently downplays this impact and assumes something like just 1.0% more sunlight is reflected. (29.8% reflected today versus 30.8% at the Last Glacial Maximum). This 1.0% assumption magically gives one 3.0C per doubling from CO2. None of these papers actually tell you they are assuming 1.0% more sunlight is reflected (because it is built into a climate model simulation and because is so preposteriously low) but that is what they are using. This study uses exactly the same assumption in the same kind of climate model simulation and, consequently, I put no stock into it. Last year this would not have got by the “gatekeepers”. The backpeddling by high-impact journals is underway. So if a climate model simulation gives a lower value of climate sensitivity (here Schmittner, 2011) the results of GCMs are welcomed? If yes, the next question would be: Why is the GCM used by Schmittner more reliable than other GCMs predicting higher values? This is still a paper based at least partially on model assumptions. 1. Since 1850 atmospheric CO2 has increased by about 40%. There is no conclusive causation between the two statements 1. and 2. Even if ALL the temperature increase was due to CO2, the linear progression would indicate a climate sensitivity of 2.25 K. This is essentially the same as the Schmittner et al median. There is no observed acceleration in global warming, so a linear progression is at least fair. However, we cannot attribute ALL the warming to CO2 because that would require us to deny that natural variability exists in any form. So, all we can say is that SOME of the 0.9 K warming MAY have been caused by CO2. This means the climate sensitivity is likely to be lower than 2 K, maybe significantly so. Unfortunately, since no-one can say with any certainty how much of the Greenhouse Effect is contributed by CO2, any estimates, particularly those based on model assumptions, remain dressed-up guesses. I agree with other posters that the near future will see further reductions in the estimates of CS. Even 2.3 C per doubling is way out there. I think it’s more like 0.3 C. How does 2.3 C fit in with 0 warming since 1998 while CO2 increase is at the highest ever? There must be some very big negative effect exactly matching the CO2 effect. Is the link to the original correct? I can’t find the paper. Vuk – I agree, although I came at it from the solar cycle length aspect, using Butler and Johnston’s trend line for Armagh, which is similar to the CET in climate and latitude. I might add that using Butler & Johnston 1996 with the CET gives you a climate sensitivity by difference of roughly 0.7 C/doubling, ie similar to Lindzen & Choi 2011 and nowhere near Schmittner et al’s value. In other words the world is not going to fry because of CO2, carbon tax or no carbon tax (sigh). 1.7c to 2.7c is still way too high. These figures are still based on the erroneous assumption that backscattered LWIR has the same effect over oceans as it does over land. Black body calculations are inappropriate for liquids that can evaporatively cool. A more realistic range would be 0.25c to 0.3c for a doubling of CO2 concentrations, and it may be decades before we see even that as the assumption of pre industrial levels of CO2 at 280ppm could well be incorrect. Those doing the black body calculations claim around 1 degree of warming for a doubling of CO2 from pre industrial levels* without feedback. However Earth is not a black body. 71% of the surface is ocean. So divide that 1 degree of warming into two parts. 0.29 degrees for land and 0.71 degrees for oceans. Add this 0.213 degrees back to the 0.29 degrees for land to get 0.503 degrees of warming for a doubling of CO2. Conclude that 0.2515 degrees of warming will be neither dangerous nor catastrophic. Further conclude that with a CO2 sensitivity this low there are not enough known or projected fossil fuel reserves to burn to cause dangerous or catastrophic global warming. Even if the initial 1c is taken as 1.2c, the figure for sensitivity is still only 0.3018c. 1.7c to 2.7c??? Not on this planet. What amazes me in those probability density functions (pdf), both the older (fat tailed) ones and the present one here, the possibility of a total negative feedback is virtually excluded (ie impossible) in many of them. The pdf is zero below ~1°C. How can one make such statements? Especially when speculation about fat tails at 5 °C or even more ..
Carl, you remember that riff..
Or has time re-written every line ? Tell me, would we? Could We ? Anyway, it’s another arrow in the elephant. >Is the link to the original correct? I can’t find the paper. It seems as if the link to the original paper has been taken down (although a cached version of it may still be available from google). Probably the co-author that posted it realized the error in his ways–as Science magazine greatly frowns about posting “in press” papers before they appear in the Magazine. This is a perfect example of what lowers your google ranking. There’s not a bit of content in this article that is original for WUWT. It’s reproduced verbatim from another website. Google isn’t interested in rewarding copy & paste. It’s up to you of course to determine whether the tradeoff is worth it but this IS damaging to your search rank. I doubt Donna will be surprised by the useless IPCC. There is a quite highly rated political blog [I won’t name it because I don’t much care for the owner] that does nothing but allow commenters to post the title and intro paragraph to a news story. Readers can then click on the title for the original link, then comment on the story on the blog. It’s the ultimate cut ‘n’ paste blog, but it still gets good ratings from google. I suspected some such, because I know the policy at AAAS. But it was only one of my suspicions. You can call it progress I guess. But the real temperature rise per doubling is still ten times too high. It is .2 -.4 degrees per doubling based on what the real empirical data says. i still think taking an opinion poll of what the effect will be, is not only unscientific, it is STUPID ! So that world renowned climate scientist Al Gore was a bit wide of the mark? This is a perfect example of what lowers your google ranking. There’s not a bit of content in this article that is original for WUWT. When I spent some time worrying about Google ranking and my Pame Smart page, I concluded Google worked in mysterious ways and kept changing them. I figure as long as enough references show up, it’s probably okay. I suspect that all the content free me-too and taunts comments dilute the key phrases anyway. Even with Goggle deranking, it looks like people will find WUWT and some will bookmark it. I also Googled |rossi e-cat mw| and sites like e-catworld.com, pesn.com, and rossicoldfusion.com scored higher than the recent WUWT page (#10). Fair enough, though I’m not sure why wired.co.uk got #3. For some may be small, but for my graphs a major milestone. Some three years ago a linked [I] stat counter to all graphs I put on line. The stat counter just recorded 100.000. The WUWT is by far the greatest contributor. When climate scientists finally reach a unanimous decision that climate sensitivity is zero, we will have reached the truth. Sometimes I think people forget we live in a medium of gas. Remember that stuff; gas? Expose it to the tiniest bit of heat and it lifts and separates. Trying to heat gas in an open area is like trying to herd cats. And claiming that gas in an open area can “trap” heat? well……I suppose mankind has made sillier claims in the past. Falling off the edge of a flat Earth comes to mind. According to Aussie politicians, the temperature change is irrelevant – at least, no-one can get any of the ones who voted in our onerous carbon tax to state ANY figure for what the tax will do for the World’s temperatures. Actually changing the temperature or keeping it to below an x degree increase has become a side issue and the mantra of ‘a green energy future’ and ‘cutting pollution’ (meaning CO2) has taken on a life of its own. Sensitivity derived from land minimum and maximum temperatures, which over estimate warming by a large amount and most of the actual warming due to increased early morning solar insolation. Real sensitivity well below 0.5. Interesting that you should say that. The extra heating of the surface from increasing CO2 is due to the weak unsaturated lines in its spectrum absorbing more infrared from the surface. This only increases logarithmically with concentration(at least that’s the conventional wisdom). At the top of the atmosphere where the CO2 radiates energy into outer space there is no such restriction. It’s all done by the strong spectral lines. This means that doubling the CO2 will double the rate at which IR will be radiated into space. I have no idea if the models take this into account, but I’d be real surprised, more like shocked, if they didn’t. 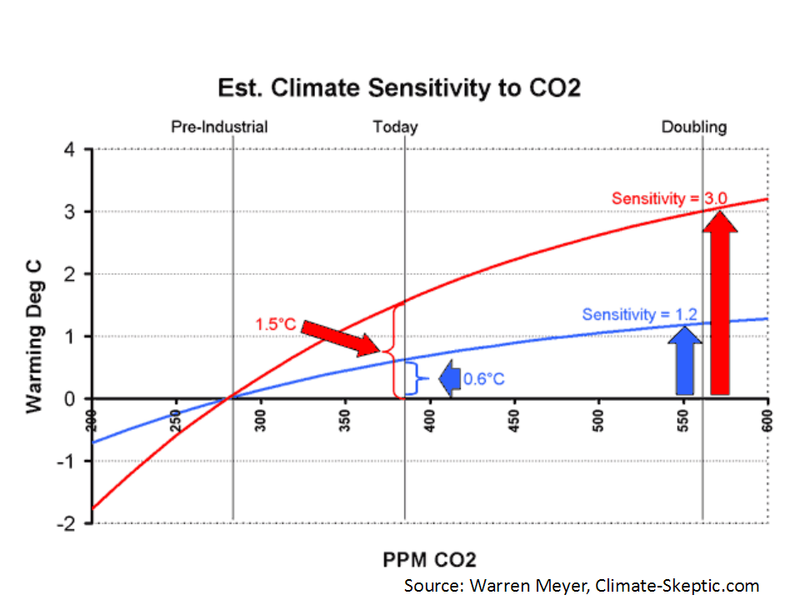 Climate sensitivity is a stupid idea which assumes that carbon dioxide actually controls global temperature and that once you know what it is doing you know the future. There is abundant empirical evidence showing that it has not happened for a century and good reason to believe that it has no influence on global temperature whatsoever. First, lets look at what temperature and atmospheric carbon dioxide have actually done. It is totally phony and makes Hansen’s 1988 claim that warming had started false. While there was almost a fifty year lack of warming from the end of the war till the appearance of the 1998 super El Nino carbon dioxide was relentlessly increasing. To explain the lack of warming that this increase of carbon dioxide should have created warming advocates came out with the idea that large amounts of industrial aerosols formed by war production had suppressed that warming. There is only one problem with that excuse: the southern hemisphere cooled more than the northern hemisphere did but the aerosols were almost all released in the northern hemisphere. Satellite temperature measurements show that the only real global warming within the last 31 years was a short spurt that started with the super El Nino of 1998. In four years it raised global temperature by a third of a degree and then stopped. It was caused by the large amount of warm water that the super El Nino had carried across the ocean. Warmth from it lingered, suppressed one of the cool La Nina phases of ENSO and created a six year warm period I call the twenty-first century high. ENSO itself did not return until the 2008 La Nina appeared and looks like we are back to normal again. The step warming of 1998 to 2002 is responsible for the very warm first decade of our century but it was oceanic in origin and definitely not any greenhouse warming. There has not been any warming since then as the recent BEST temperature study indicates despite Richard Muller’s attempt to cover that up in a BBC interview. Their ground temperature measurements actually show that there was no warming for the last 13 years. This is the embarrassing ground truth. And what is more embarrassing yet is that carbon dioxide just keeps on going up at the same steady rate it has been doing it since the measurements began in the fifties. Looking at that temperature history it hard for me to understand how anyone be serious about “sensitivity” and expect it to tell the future. On top of that we have observations of Ferenc Miskolczi who determined, using NOAA database of weather balloon observations, that the infrared absorbance of the atmosphere has not changed for 61 years. During that same period of time the amount of carbon dioxide in the air increased by 21.6 percent. This means that addition of this amount of carbon dioxide to the atmosphere had no effect on the absorption of infrared radiation by the atmosphere. No absorption, no greenhouse effect, case closed. The closer these guys get to the reality that climate sensitivity to CO2 forcing is a small number the better. But honestly, how can the sensitivity be high in the face of stable or declining global temps in the last 10 to 15 years, during which time CO2 continues to rise without pause. Common sense review of the Earth’s climate history, detailed by some above, tells us that the climate is insensitive to CO2 and is dominated by negative feedback. GW is real, AGW is a maybe, CAGW is hysteria. Gotta love that consensus. This is definitely the biggest blow to CAGW I have seen in my 4 years of watching the debate. It even beats the “gate”. Would love to see a remake of Gore’s movie, perhaps with guest roles from the nobel laureate hobbit who writes for the NYT and jimmy hansen with some final words. “Inconvenient” is now actually a really fitting word in light of these new estimates. A weakness of the paper, however, is that the authors may not have adequately considered nonlinearity in the equilibrium response of the climate system to different combinations of negative and positive forcings. A number of papers (eg here, here and here) have shown that the degree of nonlinearity can vary significantly between different models, and although I have not used the energy-balance style model that Schmittner et al use, I suspect it will not represent this range of uncertainty well. What this means is, that even though they may be able to accurately estimate the “sensitivity” at the LGM, in terms of the ratio of temperature response to net radiative forcing, we cannot be sure how this will translate into “sensitivity” for 2xCO2. A possibly more statistically sophisticated and comprehensive attempt to account for uncertainties can be found here, for example. So, what we have is one paper that may have some flaws that says that their best estimate for climate sensitivity puts it in the lower part of the IPCC range…hardly a reason not to be concerned about the effects of increasing greenhouse gases. Rather, it means that we have a better hope of making the transition away from the dinosaur of fossil fuels in a way that is still soon enough to prevent the worst damage but still gradual enough to not have a very large economic impact…that is unless the “merchants of doubt” continue to delay things, making the eventual necessary transition more rapid (and starting from a higher baseline). Prediction: AR5 will come out with continued terrible futures written all through it, Pachauri will say what a great job he has done and now he is retiring, and the in-coming guy will back down the CO2 alarm with reference to “new” data, especially “new” satellite and ARGO floats, thank the Lord and Patchy that the IPCC urged these studies to be done. Meanwhile, in Australia, a female Prime Minister will retire to write a book on how she and her country stood up, alone, to do their duty to the world, though thank the Lord the troubles went away with China’s sulphur and soot emissions, despite the HFCs it is releasing. Well! Don’t I feel vindicated. These numbers add weight to my little method of estimating climate forcing (I use a method from combustion engineering called the path length method). If Steve Mosher reads this, I’d appreciate a clarification of something. The MODTRAN is an estimate based on HIGHTRAN. Does MODTRAN go to very high levels of CO2? The estimate of absorbance from the combustion engineering method seems to track the climate estimates pretty well at levels up to about 100 bar.cm, but start to diverge after that. By 800 bar.cm the curves are distinctively different. The combustion engineering estimates indicate that the rise in absorbance would be nearlhy parallel to the x axis, even with a log/log plot. The climate model absorbance would be a straight line rising constantly in a log/log plot. Speaking of feedbacks, I have had a nice back and forth with Dr. Schmidt at Realclimate. He was very polite and helpful, so I thought I’d give him a positive plug for that. I now have a rational explantion as to why the ocean is so cold. It is based on the ability of evaporation at high latitudes to pull large amounts of heat out of the ocean. When there is open ocean with windy air at cold temperatures (like -20 or colder), the rate of evaporation is pretty high, so the phase transfer portion of heat transfer dominates. This cooled water then sinks (salt water does not reach a density maximum at 4C like fresh does) I haven’t fully digested this yet, but this would appear to be a very significant negative feedback. Conductive transfer through ice would be much lower than evaporative transfer. That is, as it gets colder, more ice forms and heat loss decreases. Similarly, as it gets warmer, ice cover decreases and the area available for this heat transfer mechanism increases, hence heat loss increases. The heat loss at the polar area is important because atmospheric water is lower there and hence radiant loss from the atmosphere to space will be higher. You are talking nonsense here. (1) In fact, treating water as a blackbody in the far infrared is an excellent approximation. It has an emissivity that differs from 1 by a very small amount (less than 1%, as I vaguely recall). (2) Your idea that objects that evaporatively cool somehow behave different radiatively is without any merit that I know of. The amount a body radiates does not depend on the amount that it cools by other means. It just depends on its temperature, surface area, and emissivity. d) and ends with a statement that more research is needed….. Remember this post by Willis? The consensus folks were in high praise for how prescient this guy was in 1975 and tried to use the paper to flog skeptics. Guess what senstitivity he used? That is a transient climate response, not an equilibrium climate sensitivity. And, 2.25 K happens to be very close to what the IPCC models give on average for the transient climate response (whereas their average equilibrium sensitivity is about 3.3 K). Strange…You seem to use the word “variability” to mean “variability only in the direction that I want it to vary in”. Natural variability can occur in two directions, up and down. It could be that the temperatures would have been lower in the absence of anthropogenic forcings. Even if you think that this is unlikely, what we did know with a pretty high degree of certainty is that the net effect of anthropogenic aerosols is to cause cooling. There is still too much uncertainty to narrow down very well how much warming that greenhouse gases otherwise would have caused they may be offsetting, which is why the modern temperature record does not produce very strong constraints on estimates of the climate sensitivity. So long as the greenhouse effect is retained, there is no climate science. Everyone and his brother has brought forth evidence that there is no consistent correlation of CO2 with temperature in the modern era, and my comparison of temperatures in the atmospheres of Venus and Earth makes it obvious that there is no greenhouse effect in either one (for CO2 concentrations from less than 0.033%–in 1976, when Earth’s “Standard Atmosphere” was last updated–up to 96.5% for Venus; in other words, for any concentration of CO2). … (except that the CO2 levels reduced forest cover and increased grassland/tundra). The 800 year lag which occurs very consistently throughout all of the timelines available in the ice ages should be considered enough evidence of the above by itself. Perhaps one need to think about that logically to understand it rather than be biased by a CO2-based climate theory. So long as the greenhouse effect is retained, there is no climate science. Harry’s work is worth a read. It is consistent with the findings in other studies, that surface temperature is determined by a gravity and solar energy. Everything else – water and co2 – they are simply going along for the ride. This would explain why for zillions of years the earth’s average temperature has remained in a very narrow band from 285 – 295 K. That is about a 3% variance in average temperature over the past 600 million years. The only explanation that is reasonable for such a small variation is that something that does not vary very much must regulate temperature. CO2 and H2O both vary too much to be the climate regulators. The mean should be around 0.4°C, with a serious non-zero sub-zero tail. AGW is bunkum, stem to stern. >From IPCC Report AR5, July 2015, para 2.7.1 3: “There have been estimates of a lower climate sensitivity (Schmitter et al 2011, …) but there are some ambiguities and they remain controversial.”. There is no other reference to it in the report. It has been perfectly legimitate to take all model outputs and average them with no concern as to how well they were performing when the numbers were generated. Someone will produce a paper that claims it is 8 degrees, so the average of all these views will be 4. Joel, I don’t know your educational or experience background, but you appear to be very conversant with all the pro-AGW literature. As for me, I’m just a degreed accountant with some statistical training, at least enough for auditing purposes. In my 60 years on this planet I’ve experienced some interesting and severe weather. In 24 years of military service, I’ve been in the arctic in the winter, and the desert and jungle in the summer. I’ve taught scuba diving and had mixed gas training. In other words, I’ve lived in the real world and accumulated some practical knowledge to go with my academic knowledge. We all know CO2 is an odorless, colorless trace gas required by green plants to produce the sugars and O2 that support life on this Earth. We also know that the concentration of CO2 in our atmosphere is nowhere near the level where living, breathing animals are in danger of suffocating. But you, and others like you, are expounding on an unproven idea that increasing CO2 levels are causing the planet to warm, and relying on computer models to bolster your argument. Without any real proof showing cause and effect. Instead of arguing over models and statistics based on questionable data, why not design some real experiments to prove the idea. At the top of the atmosphere where the CO2 radiates energy into outer space there is no such restriction. It’s all done by the strong spectral lines. This means that doubling the CO2 will double the rate at which IR will be radiated into space. I have no idea if the models take this into account, but I’d be real surprised, more like shocked, if they didn’t. This cooling effect of CO2 is never separated from the warming effect as far as I’ve been able to tell. They attempt to cover both by building vertical profiles of the atmosphere. I think I read where they use 3 of these profiles and all the models are built off these estimates. It’s something like estimating global temperature by averaging 3 weather stations. Gotta love that consensus. This is definitely the biggest blow to CAGW I have seen in my 4 years of watching the debate. It even beats the “gate”. I am hoping that its (correct) claim that the IPCC made an invalid alteration in AR4 of key evidence it cited as to climate sensitivity will get quite a lot of exposure, relating as it does to the core scientific basis of the AGW/dangerous climate change case. If you were willing to post on WUWT a link to the article on Climate Etc, that would be great. I have actually done a lot more work on the IPCC cited climate sensitivity estimates, and in particular the ‘uniform prior’ issue, than is covered in the attached piece. I have concluded that the IPCC AR4:WG1 Fig. 9.20 sensitivity PDFs are probably all substantially biased to high climate sensitivity. Very good points. I’d add that at the surface we have maximum temperatures limited by convection and not radiation, therefore the increased emissivity at the top of the troposphere dominates and the net effect of CO2 is cooling, meaning that the sensitivity is actually negative. At least, let’s begin to consider that possibility. Sunlight penetrates the water to heat it up very slightly and air temperatures can warm the water also, but these play smaller roles in evaporation of water than the amount of water vapor in the air above the water. Evaporation from a water body with no internal heating (like a hot spring) is controlled by the water vapor content of the air above the water and by the amount of turbulence in the air that can take evaporated water vapor away from the water surface. The less water vapor in the air, the more water can be evaporated from the lake, no matter what the temperature. The more turbulence (usually increases with wind speed), the faster the evaporated water vapor is removed from the near the water surface, thereby increasing the rate of evaporation. I’m not certain what everyone is so excited about. It is a model. It has lower sensitivity estimates than other models commonly cited by the IPCC. I don’t think the models that the IPCC cites have a lot of credibility, and I don’t see why this model should be seen as credible either. It provides a lower sensitivity estimate than the IPCC models, but even though I have reason to believe that the IPCC models are estimating too high, is there anything about THIS model that suggests we should see it as more credible than any other model? When I see someone produce estimates that have some degree of verification from actual measurements, then I’ll get excited. Until then, beware confirmation bias. We now live in a world in which warmists, many of whom believe warming will be a disaster, cheer every sign of a warming world as they think it proves them right. Skeptics, many of whom believe that a cooling world would be a disaster, cheer every sign of lower temperatures as a means to prove themselves right. Are the cheerleaders for this paper cheering because they have reason to believe it is right? Or only because it suggests a number lower than what the warmists would have us believe? It is inconceivable that paleo evidence can provide a better constraint on climate sensitivity than the 20th century temperature record. Think about it. The 20th century record can only get you the TCR. paleo gets you the ECR. so you have it backwards. the equillibrium climate response ( sensitivity) takes centuries to develop. 150 years of temperature data can only get you the transient response, not the steady state response. I could not tell you exactly what level of C02 that MODTRAN is validated to off the point of my head. best to start just reading some of the validation literature or better look at LBL stuff. And is complete hogwash for that very reason. The forcings are changing over that period also. How could you know that the climate sensitivity itself is not changing? I disagree with even the 2.3C sensitivity number. Long-term, stable systems generally must have negative feedbacks or they would not be stable. Thus I believe the net feedbacks are negative which means the real sensitivity factor is likely to be less than 1C. The lull or possibly even slight decrease in temperatures over the past 10+ yrs is consistent with this expectation. Natural effects are clearly overpowering any enhanced warming effects due to CO2 at the moment so CO2 cannot be the major driver. I think alot of the issues surrounding climate sensitivty and positive/negative feedback relate to time-ie fast versus slow feedbacks. High climate sensitivity estimates need to add another value to the graphs-time. I.e. if it takes 1,000 years for full positive feedacks to kick in, isnt this relevant to the estimates, and to humans in general? This is where alot of the confusion arises I suspect, eg it takes hundreds of years to melt ice, any such feedback on climate sensitivity needs to be factored in, in terms of hundreds of years. I dont see this in their graphs. apologies if i have missed this, but is this new assessment based on empirical observations or models. If models, do we not have the sam criticism of the models that suggest high CS? What empirical based data do we have to show low (or high) CS? I second this request for empirical based data. My understanding is free floating so called “greenhouse gas” molecules in the atmosphere are nothing more or less than photon pumps. Because of the gravity induced adiabatic lapse rate more photons are pumped upwards than downwards. The second LAW of Thermodynamics accounts for the downwards photons. So, this latest ‘estimate’ (model derived) is based on poor data retrieved from poorly sited weather stations and they still get 66% possibility. If this was the chance given to me for a new operation to ‘cure’ a disease I would stick with the disease. Meh. More models. The best thing about this result is that its an attack on the confirmation bias that has cemented in this fantasy of 3C per doubling. Does anyone really think that even if the IPCC reduce the figures on the warming ability of CO2 that it will change anything. There’s money to be made and in climate science that is the ‘settled’ part. CO2 and any other atmospheric molecule cannot and does not INCREASE the temperature above the maximum temperature achieved by short wave radiation being constantly absorbed by the earth. That’s my theory and I’m sticking to it. However changes in the protective layer of ozone in the stratosphere could be more important than is currently believed. Sorry for being a bit negative about the lower CO2 figure but we’ve just got a Carbon Tax and I know that anything the IPCC says won’t even be considered by our incompetent Government. Joel, you have called my claim about the effect of LWIR backscattered onto liquid water nonsense, then proceeded to counter with well known information about the emission spectrum of water, effectively a strawman argument. The issue is not whether the IR emission spectrum for liquid water is close to a black body, but whether backscattered LWIR can affect the cooling rate of liquid water that is also free to evaporatively cool, compared to a solid black body, which at the Earth’s surface can only cool through radiation and conduction. My claim that the effect of backscattered LWIR over water is less that that over land is based on empirical evidence. I have conducted the experiment myself and found that liquid that is free to evaporatively cool responds very differently to incident LWIR than water that can only cool through radiation and conduction. If you want to call my claim “nonsense” then I would ask you to provide a link to an empirical evidence that LWIR has an equal effect over water as it does over land. No hand waving, no calls to authority, no computer models and no black board scribbling. Empirical evidence from controlled lab experiment only. Link or put a sock in it. AGWScience Fiction scientists haven’t forgotten it, they have excluded it. Y’all arguing with them have to understand that they have created a different physics, giving properties of one thing to another, taking laws out of context, and reducing all their science fiction premises to one dimensional properties and processes clamped to these fictional premises/memes. An atmosphere without volume and weight (gravity) is not real, their atmosphere of empty space of ideal gases is describing a non-existent world of pure fiction, because their premises about the properties and processes are pure fiction. Their conclusions therefore are not based on real world physics, but on their fictional version – so, for example, carbon dioxide as ideal gas in AGW world has no volume and no weight relative to the other gases as in our atmosphere, as an ideal gas it diffuses through empty space bouncing off and never interacting with the other ideal gases, thus without weight it can stay up in the empty atmosphere accumulating into a blanket for hundreds and even thousands of years being bounced around in elastic collisions by the other ideal volumeless weightless gases and so remaining thoroughly mixed. What there has been a distinct failure to appreciate in all these arguments is that their basic AGW premises are from a distinctly different own version of physics, their own science fiction world. And moreover, have no internal consistency or logic when related back to real world physics. The problem is exacerbated because these science fiction memes have been so successfully introduced into the education system in the last decades that they are now unthinkingly and ubiquitously held to be ‘real’ physics. They describe a nonsense world. Ideal gases don’t rise when heated because they’re not subject to variations in temperature .., for the same reason they don’t sink if heavier or rise if lighter than than the the fluid gas atmosphere of real gases, as does carbon dioxide displacing air and always sinking and methane lighter than air and always rising, unless work is done etc. Ideal gases in the AGWScience Fiction world are too busy travelling at vast speeds thoroughly diffusing in an ATMOSPHERE of EMPTY SPACE to be bothered by such things as having real properties. Most arguing against AGW, anti and lukewarmers alike, thinking AGWScientists ‘haven’t included this or that’, haven’t examined their actual AGW core beliefs about properties and processes. You’re, generic, arguing at cross purposes because you don’t understand that AGW basic premises about the world are physically different, and they think you’re nuts bringing in convection and the rest..
AGWSF doesn’t have empirical based data for any of their basic claims of properties and processes. You’re not dealing with real scientists who have forgotten to include something, you’re dealing with science fiction scientists who have certain body of beliefs about properties and processes. It is a distinct body of beliefs, a distinctly different belief system. It is a science fiction world, you err in taking any of it seriously. Steven, I am curious about the paleoclimate picture being talked about by the AGW crowd. Could you post a link that details this argument? Or is it only that temperature is correlated with CO2? If so don’t bother as I’m well aware of the Antoine equation. I quite agree. To get 2.3 degrees K in the warming direction might not even be possible with the ice sheets at such high latitudes, and if possible might take one or more thousand years, i.e., not particularly relevent to the next 100 years of fossil fuels. I have several issues with the quality of the “science” in the paper. The reference for the variants of the University of Victoria model used dates to 2001. The paper includes no discussion of that model’s diagnostic results, leaving no reason to believe that it is not subject to the same correlated errors associated with the more recent and presumably better AR4 models, both those known at the time of the AR4 and those reported in the years since. Apparently model results can support conclusions about the climate without review of the diagnostic results of how well they compare to the observations, and reporting of the corresponding increase in error and uncertainty of the results. Perhaps the key abuse of “science” in the climate literature is the failure to consider model diagnostic issues in the reporting of model results. Since most of the differences in forcing in the last LGM are not due to CO2, any sensitivity result related CO2 doubling is purely mathematical. The assumption that the sensitivity would be the same for CO2 forcing that is coupled differently spatially and chemically to the atmosphere, land surface and oceans is unjustified in a nonlinear system. For some may be small, but for my graphs a major milestone…. This is a perfect example of what lowers your google ranking….. This is getting a bit old. Anthony has already told us he would be busy writing his paper and would not have the time to devote to WUWT just now. I find your repeated needling him after he has explained that rather infantile. I am surprised that he has managed to do as much as he has to keep this blog running. Well it is most comforting to learn from Schmittner et al, that there is no possibility that the climate sensitivity could be less than 1.0 deg C, nor more than 3.3 deg C.
But it is even more illuminating to see that the well known logarithmic relationship between the mean global surface Temperature , and the atmospheric CO2 abundance has a slope (of the T versus log CO2 linear graph) that probably has one of five likely values, with lower probabilities for values (of the slope) intermediate between those five “resonances”. T2-T1 = m. log ((CO2,2)/(CO2,1)) where the notation has its obvious interpretation, with m having the five frequency resonance function. Yes the bigger the tera-computers, the more bizarre the models are. Well I still believe that the SUN (energy source) is the FORCING for the climate system and that any FEEDBACK LOOP should connect the output (mean global surface Temperature) back to controlling THE SOLAR FORCING INPUT. And in any case ; IT’S THE WATER !! Well that is a somewhat foggy statement (by John). Certainly the Temperature of my house doesn’t have anything to do with evaporation from say the ocean. Maybe one should state specifically WHICH Temperature “has little to do with evaporation”. It seems to me that the Temperature OF THE ATMOSPHERE has nothing to do with evaporation from the ocean; but it is equally true that the RELATIVE HUMIDITY OF THE ATMOSPHERE also has nothing whatsoever to do with evaporation; which is driven primarily by THE TEMPERATURE OF THE OCEAN SURFACE. What do you mean that the relative humidity of the atmosphere has no effect on EVAPORATION ? Well it doesn’t; the relative humidity of the atmosphere affects the RATE OF CONDENSATION from the atmosphere; NOT the rate of EVAPORATION from the ocean. The NET LOSS of H2O molecules (locally) from the ocean depends on the difference between the RATE OF EVAPORATION which depends on the LIQUID TEMPERATURE ; and the RATE OF CONDENSATION which depends on the RELATIVE HUMIDITY of the ATMOSPHERE. The NET LOSS also depends on local winds which can remove the newly evaporated H2O molecules from the interface, thereby preventing their condensation back in the same place. As the climate sensitivity (aka equilibrium climate sensitivity) is not an observable, claims regarding its magnitude are scientifically meaningless. No-one has any idea what the ECS is likely to be. All your arguments stem from an inherent belief in the veracity of models. All my arguments stem from a preference to use observed data. All the IPCC estimates you quote rely on model assumptions. Any estimate of ECS is an even wilder guess than any estimate of TCS. As I clearly stated, the ‘on track’ CS (TCS if you like) is only around 2.3 K if one assumes that ALL the observed warming is due to CO2. That assumption by itself further assumes that CO2 is even capable of having a significant effect on global temperature. Any extension of TCS into some vague an totally unproven notion of ECS is pure speculation. As to variability – of course it works both ways. That is why the global temperature graph since 1850 shows periods of warming and non-warming and cooling. The trouble is the pro-cAGW crowd will only accept that CO2 causes warming and ‘natural variability’ causes cooling. The warming period of 1910 to 1945 is considered to be before the ‘period of anthropogenic effect’ often quoted by pro-cAGW posters. Therefore, they assume it is due to ‘natural variability’. They ignore the fact that it is of similar magnitude to the warming of 1975-1998 which they confidently state is due to CO2. The illogicality of that argument is astounding..
At some point, the pro-cAGW commenters will have to recognise that the observed data DOES NOT support the models produced by the IPCC. Time will tell. If the global temperature starts to increase in an accelerative fashion, the theory of ‘increased CO2 = cAGW’ may be correct. As it stands today, that is not the case. The overall trend since 1850 is a warming of appx 0.06 K per decade and it is currently decreasing! Shorter term trends are irrelevant. you’re both right and wrong. Konrad, you’re right in stating that the ocean, if subjected to an increased heat flux from above will cool by evaporation, whereas the land surface (you mention a solid body) will not. The land surface is not entirely void of water and therefore may also evaporatively cool, but this cooling is strongly limited by water availability as demonstrated first (I think) by Manabe et al. (1992, J. Climate). This is the reason why land surfaces warm or cool more than the ocean when global climate changes. Konrad, you’re wrong in stating that climate models do not take this effect into account. Both the more simple model of Schmittner and the more complex models of Manabe take into account evaporative cooling of the surface. For this reason climate models predict larger temperature changes over land than over the oceans, which is consistent with paleoclimate reconstructions and with the recent observed temperature changes. Joel Shore, you’re right about some of the weaknesses of the paper such as the fact that non-linearities in cloud feedbacks are not considered in the uncertainty. I also agree with you that the exclusion of very high climate sensitivities has a positive meaning, that is that we still have time to figure things out and turn things around. A climate sensitivity of 10 K would mean that we’re doomed already, no matter what we do. Joel Shore, you’re wrong in saying that Konrad was taking nonsense. Well, his calculation was nonsense but he had a point in evaporative cooling being different for ocean and land. We seem to have forgotten that climate models operate on energy flux in W/m^2 and not in actual energy units. Since temperature changes require changes in energy and not just energy flux climate models are completely incapable of demonstrating temperature change directly and use a “climate sensitivity ” factor to convert the so called “climate forcing” output by climate models as W/m^2 into global temperature changes in the form of degrees C.
5.35ln(2)=3.71 X 0.75 = 2.78°C (Hansen et al 1981 model #4 output was 2.78°C for a doubling from 300ppmv to 600ppmv CO2). 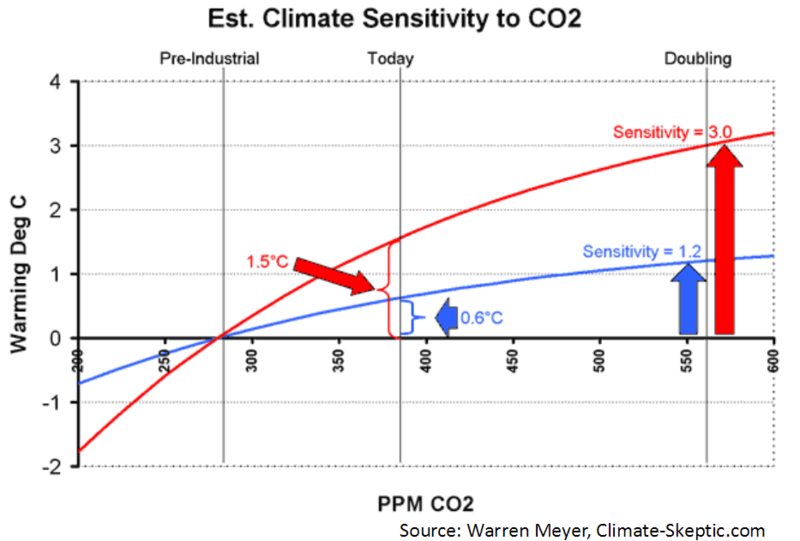 This climate sensitivity factor is key to the entire climate change issue because its foundation is the same as that of the CO2 forcing parameter of the climate models stemming from the 0.6°C of warming since preindustrial times being ralated to the 100ppmv increase in concurrent atmospheric CO2 concentration increase. The IPCC 1990 FAR shows the Little Ice Age and the world recovering from this at a rate of about 0.5°C/century which is an identical period of time over which the observed 0.6°C of warming occured with the 100ppmv increase in CO2 concentration. This leaves 0.6°C minus 0.5°C = 0.1°C possibly attributable to the increase in atmospheric CO2 concentration. The climate models produce 5.35ln(380/280) = 1.634W/m^2 of forcing over this period during which 0.1°C can be attributed to the 100ppmv increase in CO2 (from 280ppmv to 380ppmv). 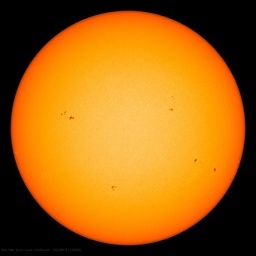 The climate sensitivity therefore is 0.1°C/1.634W/m^2 = 0.0612°C for each watt per square metre. The IPCC 2007 4AR shows most of the climate model projections of forcing from a doubling of CO2 falling in this same 3.71W/m^2 range so based on a derivation for climate sensitivity using the same criteria as was used for the CO2 forcing parameter of the IPCC climate models the climate sensitivity for a doubling of CO2 would therefore be 3.71W/m^2 X 0.0612°C/W/m^2 = 0.227°C! This is vastly different from the 1.2°C to 3.0°C projected as climate sensitivity for a doubling of CO2 since preindusrtial times. The 1.2°C value is rather interesting in that it is not that far off from six times the 0.227°C value calculated from the 0.1°C temperature value resulting from subtracting the 0.5°C of natural warming since the Little Ice age from the 0.6°C of observed temperature increase. One has to wonder if the purpose of the MBH98 temperature proxy was to eliminate the Little Ice Age removing the natural 0.5°C/century warming to allow the entire observed 0.6°C to be attributable to industrialization sourced CO2 emissions to prevent this insignificant actual climate sensitivity from being discovered. Does anyone have a working link to the Schmittner, A., et al., 2011 (draft/final) paper? Or their own PDF copy of the Schmittner, A., et al., 2011 (draft/final) paper? Returns four links, the two that are broken are to the paper and SOM materials. Remove the filetype:pdf gets you more hits, but still no PDF of this paper. I sort of assumed something was up with this. I would then think that what was once available was a draft copy and not a final Science copy (otherwise we’d find a link to it at Science (or at Science in press)). So was this draft paper a post peer reviewed (as in completed by Science peer reviewers) copy, as in going to the camera ready Science publication version of this paper? You claim that the difference in effect of LWIR over water and over land has been taken into account by some climate modellers. If this was the widely accepted view, why is Kevin Tremberth still looking for missing heat in the oceans? I claim that backscattered LWIR around the 15 micron band has less than 30% of the effect over the oceans than it does over land. I would welcome you pointing me to the workings of Schmittner or Manabe where they accept the reduced effect of backscattered LWIR over 71% of the Earth’s surface. Remember, pointing out that evaporative cooling has been taken into account is a similar strawman argument to that of Joel pointing out that the emissivity of the oceans is close to that of a black body. The issue I am raising is that the ability of incident LWIR to slow the cooling of the Earth’s surface is very different over the oceans than over the land. I do not mind being told that I am wrong, but please address the actual issue I was raising. Gottlieb, well I think you are being rather generous to Konrad in reworking what he said into something that makes sense. I don’t disagree with anything that you said, but I think it is a far cry from what he was saying. Even after he clarified what he meant in talking about blackbodies, he was still basically supporting a notion about the effect of downwelling longwave radiation not being able to heat the oceans that even people like Willis Eschenbach argue to be nonsense ( http://wattsupwiththat.com/2011/08/15/radiating-the-ocean/ ). And, while I may not always agree with Willis, when he says that some argument that AGW skeptics use is nonsense, he is invariably right. Joel, that is exactly the thread that Willis ran away from. The very same thread that motivated me to buy the equipment and do the experiment. Willis could not offer empirical evidence from a controlled experiment contradicting my claim. I doubt that you will either. I’m confused. I thought you mean that as a surface is heated land and oceans behave differently because evaporation from the oceans leads too cooling whereas land warms more. I’m also confused about your term “backscattered LWIR”. I assume LWIR means longwave infrared radiation. LW or IR radiation is not backscattered. LW radiation emitted from the surface is absorbed by molecules such as H2O and CO2 in the atmosphere. This increases their energy level (rotation and/or vibrational modes are excited). After a short time the molecule goes back into a lower energy state and emits a photon. This absorption/emission process is different from scattering, which is essentially the reflection of a photons path to a different direction. Scattering happens in the shortwave (visible and UV) and is the reason why the sky is blue. Regarding your calculation: sorry, but it’s really wrong. You cannot divide a 1 degree average warming into 0.3 degrees over land and 0.7 over the ocean. If the land was warming 0.3 degrees and the ocean 0.7 degrees then the average warming of the planet was 0.3*AL + 0.7*AO = 0.58 degrees, where AL is the fraction of the surface area of the planet that is land and AO is the ocean fraction. So if you get simple arithmetric that wrong perhaps you shouldn’d go further in your calculations. I guess you’re right. But I’m trying to acknowledge that people are thinking about this and Konrad certainly is. Even if that thinking leads to a wrong conclusion, it is better than not thinking about it at all, which, I assume most people do. And I sensed some truth it his reasoning concerning evaporative cooling, but maybe I have misunderstood him. By backscattered I am referring to IR radiation around 15 microns leaving the Earths surface, impacting CO2 and 50% of it being re-emitted back toward the surface. This long wave IR radiation does not slow the cooling of liquid water to the same extent as solid materials. The reason for this is that 15 micro LWIR cannot penetrate even the first 10% of the 1mm evaporativly cooled skin layer of liquid water. IR photons simply trip more water molecules to their vapour state. The thermal gradient across the skin layer remains largely unchanged. The cooling rate of liquid water is not greatly effected by LWIR emitted by CO2. So what is then happening to the LWIR? As Willis pointed out, the amount of energy being carried away from the earth’s surface by evaporation is well-known to be about 70 – 80 W/m^2. In order to claim that this is vastly underestimated, you would have to show that mean evaporation is vastly underestimated, which means mean precipitation is vastly underestimated (since it is a first-year physics problem to get from the mean evaporation of water to the amount of energy that this carries away to the surface). This seems rather unlikely. Konrad: I trust over a century of accumulated physics knowledge over the probability of someone on the internet to correctly carry out and interpret an experiment, particularly when he clearly wants to get the answer to come out a certain way. Joel Shore – indeed you may well trust over a century of accumulated physics knowledge more than someone on the internet. But as an argument that’s just an Argument From Authoriy and is absolutely worthless. To make a cogent argument it is necessary to address the actual issue. And please note that as stated, your assertion of bias applies even more strongly to the IPCC. The IPCC clearly wants to get the answer to come out a certain way, and it hasn’t even done an experiment. Joel, you are wise to be concerned about confirmation bias, especially with regard to climate science. I sought to circumvent this in the traditional way by designing an experiment that was repeatable by others. I have repeatedly encouraged others to replicate the experiment or design their own variant. So the question is not whether you should trust me, but rather whether you trust yourself to be able to replicate the work with sufficient care. If you do not have a link to empirical controlled lab experiments countering my claim, I would encourage you to conduct the following simple experiments. Place a probe type digital thermometer in a tin cup full to the brim with water. Use fibreglass and foil insulation on the exposed cord. Try heating the water by applying the hot air from a paint striping heat gun to the surface of the water. Now try heating the water by pointing the gun at the side of the cup. Slight agitation of the water below the surface should be introduced by moving the probe to prevent stratification. The results are markedly different. This test does not address LWIR as the heat is only introduced conductively, however it gives an insight into the problems of trying to heat water through the evaporatively cooled skin layer. I recommend replacing the foil reflector with a simple LWIR emitter. Use a cling film IR window and frame similar to the other side of the experiment. Use a disposable foil baking tray with its base sprayed matt black as a warm water container balanced on top of the balsa and cling film frame, ensuring a 10mm gap between the base of the tray and the cling film. Insulate the tray on the sides and top after filling with warm water. This provides a more constant LWIR source. The original foil reflector only bounces back a diminishing amount of LWIR as the sample below it cools. The third experiment I have yet to design fully. While it appears that LWIR incident on the evaporatively cooled skin layer of liquid water may simply trip liquid molecules to their vapour state, this may not be the full story. It may be that some of the LWIR is reflected. I believe that using the human body as a LWIR source and an IR motion detector, a simple experiment could be conducted to see if liquid water could also be reflecting a small percentage of incident LWIR (unlike an ideal black body). Feel free to design and build your own variant. Konrad: A few experiments that vaguely look at heat transfer under various circumstances do not overturn a century of understood physics. There is a large gap between what you show with your experiments, assuming that you have performed them correctly (and I am willing to believe that heating a water container from the side is more effective than heating it from the top), and claims that the energy due to the LWIR is magically transported out of the earth / atmosphere system. The exact extent to which the LWIR causes the oceans to be warmer by direct heating vs by reducing cooling may be of some academic interest…but it doesn’t address the basic point, which is that those who think that the energy is magically transported out of the climate system aren’t able to come up with any sort of coherent explanation to how this magic actually occurs. By the way, Konrad, you seem to assume that plastic wrap is a good transmitter of infrared radiation. Do you have data to support that assumption? Actually it doesn’t take a few experiments, it could take just one. Further to that I am not seeking to overturn understood physics, rather I am investigating an effect that does not seem to have been previously addressed. I believe the radiation physics to be largely correct (reflection still to be checked) with regard to the emission and absorption spectra of liquid water. Climate scientists seem to have made an assumption based on known radiation physics with regard to the effect of LWIR on liquid water. However liquid water should not be treated the same as other materials as at the surface interface with the atmosphere molecules are undergoing phase change. LWIR cannot penetrate this surface layer, therefore it is important to investigate the physical behaviour of this layer to understand the effect of LWIR on liquid water. The assumptions that climate scientists are making appear to be “pointing the heat gun at the side of the cup” I am not proposing a magic transport of energy out of the atmosphere, I am claiming that CO2 does not trap as much in the oceans as assumed. With regard to the IR properties of cling film I should add a clarification. You should use a more expensive “microwave safe” cling film as these are made of LDPE plastic (low density polyethylene). The lenses of many IR detectors are made of the same material. Al Gore should not have used glass in his “climate reality” experiment and the BBC should not have used PETG plastic bottles in theirs. Sodium chloride lenses are not transparent far enough into the longer wavelengths and like the more transparent potassium chloride salt lenses can be damaged by moisture. I have used warm water as the LWIR source as heat lamps and other electric radiators produce too much SWIR, which may penetrate below the skin layer of liquid water. The assumptions that climate scientists are making appear to be “pointing the heat gun at the side of the cup” I am not proposing a magic transport of energy out of the atmosphere, I am claiming that CO2 does not trap as much in the oceans as assumed. What matters at the end of the day is the energy balance at the “top of the atmosphere”, i.e., the balance between radiation received by the earth / atmosphere system and that radiated away. Trying to do backflips to come up with ways to prevent the heat from being absorbed by the oceans is not going to do any good unless you can show that you are transporting more energy out of the earth / atmosphere system as a result. I would take issue with this on two grounds. The first is that we live in the lower troposphere and most suggested negative effects of global warming to life on Earth would require changes in this part of the atmosphere. CO2 does not warm the atmosphere by direct absorption of LWIR photons. The way CO2 can warm the troposphere is through absorbing and almost instantly re-radiating 50% of LWIR around the 15 micron band emitted by the surface back to the surface. This slows the rate at which the surface can radiativly cool. The surface can transfer heat to the lower troposphere through conduction. While release of latent heat from water vapour evaporated from a warmer surface can also warm the troposphere, this is in some part balanced by the surface cooling effect of evaporation. If CO2 has a reduced role in slowing the cooling of the surface over the oceans as I am claiming, this has significant implications for its role in warming the lower troposphere and thereby the proposed negative effects of global warming. The second issue I would take with your statement concerns quantification of the TOA energy balance. I accept that that a radiative energy imbalance at TOA would indicate that the planet as a whole is either warming or cooling. However the quantification of this is poor. Satellites used are in low earth orbit and cannot look at the limb of the Earth. You will have noticed that much mathematical modelling for received radiation is based on reducing the energy received by a hemisphere by half to show the watts per m2 received by a flat disc of the same diameter. This will give a reasonable figure for albedo with regard to clouds but a poor figure for the reflectivity of the oceans closer to the edges of the true illuminated hemisphere. To better quantify the TOA radiation budget better remote sensing is required. The remote sensing platform required has already been built. Sadly DSCOVR is still languishing in a dry nitrogen filled box at the bottom of a gravity well, as opposed to where it should be in a lunar Lagrangian position. Konrad: Last things first, I agree with you on the travesty of the fact that DSCOVR has not been launched. It would be important to have it there to better quantify what is actually going on. However, in its absence, I still think we understand enough about atmospheric dynamics to determine some things. (1) In the first approximation, it is not unreasonable to assume that the tropossphere warms uniformly in altitude. (2) A better approximation accounts for the moist adiabatic lapse rate holding in much of the tropics, which leads to faster warming at altitude than at the surface. This leads to the “lapse rate feedback”, a negative feedback in the climate models. While the magnitude of the lapse rate feedback can be fairly sensitive to assumptions and thus vary from one model to another, it turns out that this feedback and the water vapor feedback involve similar physics and are thus strongly correlated to each other, so the net result of both feedbacks is more tightly constrained than each one separately. If you can get a hold of it, I would recommend looking at the book “Global Warming: The Hard Science” by L.D. Danny Harvey. In it, he does a calculation that shows how a change in the radiative balance between the surface and the atmosphere results in little change in surface temperature because the convection compensates for most of it. However, a change in the top-of-the-atmosphere radiative balance has a much larger effect. It is a very important point to understand. At http://judithcurry.com/2010/11/30/physics-of-the-atmospheric-greenhouse-effect/#comment-16901, the blogger Nullius in Verba provides an account of the issue you have raised that many readers find enlightening. According to Nullius, professional climatologists confuse amateurs by ignoring convection in the descriptions of the greenhouse effect that they provide for public consumption. Terry– I pretty much agree with what Nullius in Verba says except I would not really blame it on the climatologists. In most fields of science, it is understood that one is not really conversant on a subject once one has read only the simplest discussions and representations of it. Unfortunately, in the highly politically-charged atmosphere around climate science, people seem to think that they can read these simple explanations and then expound on the problems with the entire theory, rather than following the natural trajectory of first delving into the more complex, detailed explanations. If there is agreement that the mechanism of the purported warming effect at Earth’s surface has no relationship to the mechanism of an agricultural greenhouse, then it is high time for professional climatologists to abandon their use of the misleading phrases “greenhouse effect” and “greenhouse gases” and replace them with phrases that at the very least are not misleading. However, these phrases plus descriptions drawn from them persist in the works of professional climatologists. This persistence suggests disinclination among professional climatologists to admit and correct error. Once, I witnessed a similar psycho-social phenomenon in a field in which I was responsible for management of a significant fraction of world research. Early in my tenure, I discovered an error that invalidated a portion of the scientific basis for belief in the safety of the nuclear power program. When I reported this error to colleagues, the reaction of 100% of them was to cover up the error. Twenty-five years later, this error persists in the fabric of nuclear power technology. Contrary to popular belief, the peer review system is insufficient for the purposes of exposing and eliminating errors in the works of scientists. An organizational form of similar nature to that of an quality assurance organization is needed for this purpose, in my opinion. Terry: You have a very black-and-white, two-valued view of the world. Terminology is not erroneous or correct. It is just terminology. There may be better or worse terminology, but there also tends to be inertia in terminology, so we tend to get stuck with what first develops. At any rate, it is incorrect to claim that “the purported warming effect at Earth’s surface has no relationship to the mechanism of an agricultural greenhouse”…In some respects, there is an analogous relationship; in some respects there is not. What is correct to say is that analogies are never perfect and this particular analogy is not as close as one might think. There are many examples of terminology that may not be ideal in science. For example, the “electromagnetic force (EMF)” is not a force (and for that reason some textbooks go as far as saying that “EMF” used to stand for electromagnetic force but now doesn’t stand for anything!!! ); there are other examples that I can’t think of now, but there is a fellow-instructor who rails about these various problems with terminology in physics and says “No wonder students get confused”; my personal opinion is that students are primarily confused for other reasons. At any rate, only in the highly-politicized world surrounding climate science is such deficiencies in terminology taken to be an indictment of the entire scientific enterprise, or at least in that field. People, including policy makers, are being misled by eccentric uses of “greenhouse” and “heat” by professional climatologists into thinking that as they are relatively transparent to short wave radiation and opaque to long wave radiation, the greenhouse gases trap “heat” by shining “back radiation” on Earth’s surface. They think this addition of “heat” to Earth’s surface is the “greenhouse effect” and that the existence of this effect proves the AGW conjecture. You can satisfy yourself that this is true via a Web search on “trapping heat” and “greenhouse effect.” An example of what your Web search will turn up follows. http://www.aph.gov.au/library/pubs/climatechange/theBasic/greenhouse.htm ). This statement is false but the parliament that recently imposed a draconian tax upon CO2 emissions by the citizens of Australia evidently thinks it is true. I exchanged email with a professor of climatology over a Web posted video in which the professor said greenhouse gases had an effect at Earth’s surface (the “greenhouse effect”) that was like turning on a heat lamp up in the atmosphere. I responded that while the filament of a heat lamp was at a higher temperature than the matter that was heated by it, matter up in the atmosphere was at a lower temperature than Earth’s surface. Thus, the matter in Earth’s surface could not receive radiative heat from the latter matter. When a word such as “heat” is used in reference to disparate ideas, consequences include deception and blockage of communication. Thus, the word “heat” should be used in reference to only one concept. For avoidance of the necessity for rewriting the literature of thermodynamics, the word “heat” should be reserved for reference to “the energy that crosses the boundary.” The term “vector irradiance” is available for use in reference to the flux of radiative energy that passes from relatively cold to relatively hot matter. The “radiative heat flux” is then the vector difference of the “vector radiosity” and the vector irradiance. When use of the word “heat” is restricted in this way then it becomes clear to a person with a background in heat transfer and fluid mechanics that an increase in the long wave vector irradiance at Earth’s surface from an increase in the concentration of greenhouse gases will be negated by a feedback mechanism in which an the rate of convective heat transfer increases in the amount of the increase in the irradiance, maintaining the adiabatic lapse rate. Thus, the Australian parliament’s understanding of the argument for anthropogenical global warming is mistaken. The blame for the Australian parliament’s misunderstanding can be laid on the shoulders of those who insist upon eccentric uses of the words “heat” and “greenhouse” in communicating about climatology. When use of the word “heat” is restricted in this way then it becomes clear to a person with a background in heat transfer and fluid mechanics that an increase in the long wave vector irradiance at Earth’s surface from an increase in the concentration of greenhouse gases will be negated by a feedback mechanism in which an the rate of convective heat transfer increases in the amount of the increase in the irradiance, maintaining the adiabatic lapse rate. If the lapse rate doesn’t change, when greenhouse gases increase then the entire troposphere will have to warm by an amount sufficient so that the temperature at the effective radiating level has increased to the point where incoming and outgoing radiation is again balanced. Your statement that this amounts to the increase being “negatied by a feedback mechanism…” is thus nonsense. In reality, the lapse rate does change a little bit overall because the moist adiabatic lapse rate is a decreasing function of the temperature. This is a negative feedback effect that is included in all of the climate models…and whether the Australian Parliament understands the details of this effect are irrelevant, as long as the scientists advising them as to the potential magnitude of AGW do. The theory is that some of the outgoing IR is stopped (use whatever word you like best here) by CO2 in the troposphere, thus making the troposphere a bit warmer than it otherwise would be. The troposphere therefore re-radiates IR a bit more than it otherwise would, and the end effect is that the surface and the troposphere both end up a bit warmer than they otherwise would. Because the Earth’s radiative balance is affected (incoming energy vs outgoing) there is a net overall warming effect on the planet. That’s the theory. Physically, it is nothing like a greenhouse, so is badly named. But the name doesn’t make the theory wrong. There is never a net flow of heat (or whatever you want to call it) from a cooler object (the troposphere) to a warmer object (the surface), so no scientific laws are broken. I think you will find that most people are comfortable with the theory, ie. they accept that it is correct. Where people do not agree is in the magnitude of the process. CAGWers claim that together with some positive feedbacks the effect dominates everything else and will lead to an irreversible tipping point. There are multiple problems with this claim: Evidence from the troposphere shows that the effect is small enough to be undetectable. There is no evidence and no known mechanism for the positive cloud feedback, and possibly not for any other positive feedback. On the contrary, there is evidence of negative feedback although this too is disputed. Evidence of past temperatures and CO2 concentrations do not support the CAGW claim, which relied heavily on Michael Mann’s utterly incorrect hockey-stick. All the evidence indicates that CO2 has a much smaller impact on Earth’s temperature than is claimed by the IPCC, and that natural forces are more powerful than they allow. A recent statement by the IPCC, that natural factors will outweigh CO2 for the next two or three decades, shows that CO2 is not as powerful a factor as they claimed (because their latest statement conflicts with their past predictions), and that natural factors are more powerful. Obviously – very obviouslt – what still remains to be discovered is exactly what those natural forces are, because there is nothing at all in the IPCC report which identifies or explains them. IOW, the science is absolutely NOT settled, and the IPCC now implicitly admits it. What is absolutely inexcusable is that anyone ever claimed or allowed it to be thought that the science was settled. Had the main proponents had not bulldozed a long way outside the bounds of proper scientific process then we would not be in this very expensive mess now. CAGWers claim that together with some positive feedbacks the effect dominates everything else and will lead to an irreversible tipping point. The “tipping point” is not a general claim…and the use of this term is somewhat problematic since it tends to be used in different ways. A more accurate statement would be that most climate scientists have concluded that positive feedbacks dominate (if one uses the terminology where the Planck response is not a feedback) and hence that the expected climate sensitivity is larger than the no-feedback value, probably around 1.5 to 4 times that value. What is also true is that there is a lot of inertia both in our society and in the climate system and, because of this, it is not easy to quickly reverse course. Evidence from the troposphere shows that the effect is small enough to be undetectable. There is no evidence and no known mechanism for the positive cloud feedback, and possibly not for any other positive feedback. This statement is simply false. For example, there is significant evidence for a positive water vapor feedback of about the expected magnitude. The paleoclimate evidence is also generally interpreted as showing a climate sensitivity in the range of what the IPCC has concluded; in fact, it is mainly on the basis of that data that such a determination has been made. Evidence of past temperatures and CO2 concentrations do not support the CAGW claim, which relied heavily on Michael Mann’s utterly incorrect hockey-stick. Pretty much every statement in this sentence is unsubstantiated and false in the opinion of most researchers in the field. A recent statement by the IPCC, that natural factors will outweigh CO2 for the next two or three decades, shows that CO2 is not as powerful a factor as they claimed (because their latest statement conflicts with their past predictions), and that natural factors are more powerful. Where has the IPCC made such a statement? From what I can tell based on the thread here that contained this claim, it is based on a distortion of what the IPCC has said about some rather narrow issues dealing with the attribution of certain extreme events. What is absolutely inexcusable is that anyone ever claimed or allowed it to be thought that the science was settled. This is a false dichotomy. Science is never settled. The science of gravity is not settled…but that does not mean we should not make any policy decisions based on what we currently understand about gravity. – and there are few stronger supporters of CAGW than RB. Joel Shore – replying to “…There is no evidence and no known mechanism for the positive cloud feedback …” said : “This statement is simply false” and discussed only the other feedback(s). JS, if you are so certain that what I said is ‘simply false’, please explain the mechanism of positive cloud feedback and provide evidence of its actual existence. I don’t think I need to say anything. ““Uncertainty in the sign of projected changes in climate extremes over the coming two to three decades is relatively large because climate change signals are expected to be relatively small compared to natural climate variability“. So, like I said, “it is based on a distortion of what the IPCC has said about some rather narrow issues dealing with the attribution of certain extreme events.” You have taken one sentence, stripped of the contents of what surrounded it…and then you have left off whatever context and modifiers that are in the sentence. The IPCC was talking narrowly about attribution of extreme events, something that is notoriously more difficult to do than, say, looking at averages, and you have turned it into a much more general statement. Actually, you stripped your own quote of the statement “and possibly not for any other positive feedback” whichI focused my reply on. As for cloud feedback, I don’t think your statement is correct for that either…One could consider several ways in which a warmer world might lead to, say, a reduction in low clouds or an increase in high clouds, either of which would tend to lead to a positive cloud feedback. I agree with the notion that there is still a lot of uncertainty in regards to the cloud feedback and whether or not it is positive, but to simply claim that there is no known mechanism or no evidence at all to support such a positive feedback (as opposed to claiming, for example that the evidence is mixed) is going too far. 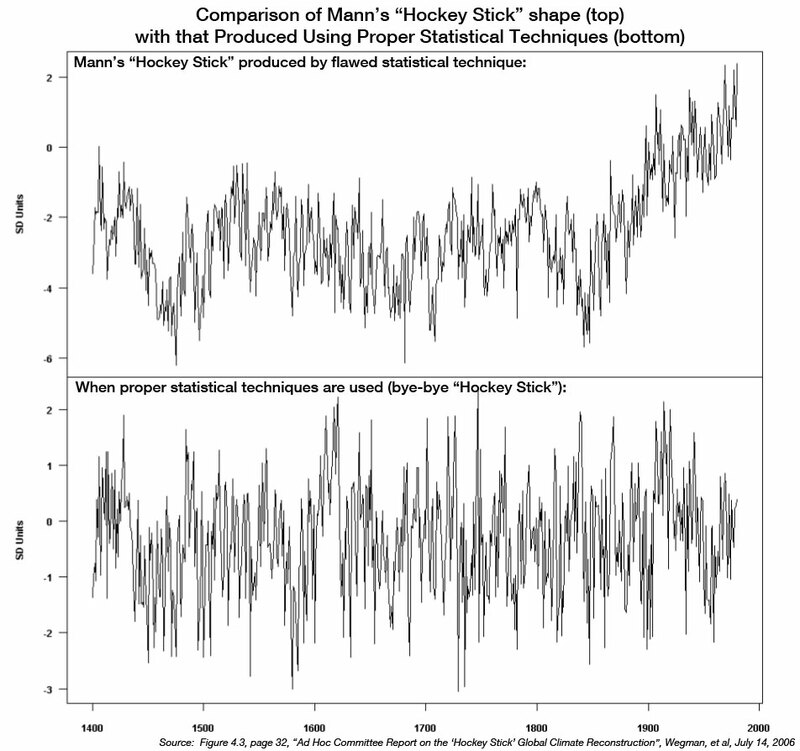 The point is that you have presented no evidence to support the claim that Mann’s hockey-stick is utterly incorrect. It is not true that evidence of past temperatures and CO2 concentrations do not support the claim of a reasonably significant climate sensitivity, and it is incorrect to claim that the claim relied particularly heavily on Mann’s hockey stick. If there was any distortion, it was by Richard Black, one of the staunchest CAGW supporters. I can’t tell because the draft report is not yet public. RB claimed to have a copy. The quote was made while discussing extreme weather events but temperature was also discussed and the quote was clearly of general application “climate change signals are expected to be relatively small compared to natural climate variability“. As an aside, it is interesting to note that “climate change” now apparently means only the man-made variety! Too far? Just describe the mechanism. Show me the evidence. There isn’t any. None. “One could consider several ways…” is not exactly a mechanism or evidence. “I agree with the notion that there is still a lot of uncertainty” is just a dirty great wriggle. You couldn’t even bring yourself to say “I agree that there is a lot of uncertainty”. All you needed to say was simply “I agree that there is no evidence of positive cloud feedback”. Smokey – yes, I know. It’s funny how climate sceptics are always called on to provide evidence (which they do) and then more evidence (which they do) and then the first evidence again ….. and so on and so on ….. yet the AGWers, who actually do have the onus of providing evidence for their claims, often can’t do so because the claims are based only on unsupported computer models. Cloud feedback is a prime example. It forms a large part of AGW (its claimed impact is marginally >i>larger than that of CO2!! [AR4 8.6.2.3]) yet there is no mechanism, no evidence, and the IPCC even states that and says that the models use fiddle factors [eg. AR4 Box TS.8 “parametrizations are still used to represent unresolved physical processes such as the formation of clouds and precipitation“]. Pay no attention to Mann’s water boy, who argues: “The point is that you have presented no evidence to support the claim that Mann’s hockey-stick is utterly incorrect. It is not true that evidence of past temperatures and CO2 concentrations do not support the claim of a reasonably significant climate sensitivity, and it is incorrect to claim that the claim relied particularly heavily on Mann’s hockey stick.” Wrong. The onus of providing evidence is entirely on the part of the alarmist crowd, and so far all their “evidence” comes from always-inaccurate computer models. But of course, that isn’t evidence at all. CO2 has been thousands of parts per million during the great Ice Ages, and very low at times when the earth was much warmer than now. Water vapor has fifty times the effect of harmless, beneficial CO2. But governments can’t tax water vapor, so they demonize “carbon”, which can be taxed. And the preposterous belief that Mann’s hokey stick wasn’t completely fabricated from a bogus proxy record and phony statistics is solid evidence of anti-science true belief caused by cognitive dissonance. The more we learn about climate sensitivity to CO2, the more insignificant the effects of CO2 become. Joel, I do take convection into account as I indicated in a previous comment. This is how the troposphere warms, from the bottom up. The air is warmed in two ways, firstly by conduction from the surface which causes convection of warm air to higher altitude. Secondly by the release of latent heat from water vapour during condensation at altitude. A pressure gradient exists across the atmosphere and unless gravity can be cancelled, warm air and water vapour will rise , moving heat away from the Earth surface. The problem with much of global warming theory is that it focuses too much on radiation and too little on the physical movement of gases and liquids in the atmosphere. If CO2 does not cause significant warming of the troposphere, it cannot have significant effects on life on Earth. It will effect us little if the tropopause is raised by 300m. It is often stated that greenhouse gases keep the Earth around 33 degrees warmer on average than it would otherwise be. When compared to the surface of the Moon which is the same distance from the sun this would appear to hold true. However by looking at averages physical mechanisms are ignored. After 6 hours of sunlight the temperature of the lunar regolith is hotter than the sand in the hottest desert on Earth. Our atmosphere is actually cooling Earths surface during sunlit hours. Part of this is due to clouds, but for the most part it is through conduction, evaporation and convection that our atmosphere cools the surface. Water vapour, a greenhouse gas capable of reflecting outgoing IR, is also part of the hydrological cycle acting as a giant vapour/condensate heat pump transporting heat away from the surface. We do not yet have the technology in place to empirically quantify the TOA radiation budget. Even if we could detect an imbalance a subtle as that likely to be caused by increases in CO2, it would not tell us what effect that would have on the lower troposphere where we live. A far better understanding of the physical behaviour of gases and liquids in our atmosphere would be required. Konrad – you say that “I do take convection into account as I indicated in a previous comment.“. It is apparent from this graph that the troposphere temperature reacts much more than the surface to ENSO – the major spikes in the graph are El Ninos, the dips are La Ninas. It seems to me that the major mechanism on this time scale has to be convection not radiation, because I seriously doubt that changes in radiation from the ocean surface could produce such large results in the troposphere on that short time scale. On the other hand, a burst of warm air rising could do the trick (and the ending of the burst, in the other direction). So the question is simply: Does what I’m thinking make sense? And, of course, is the mechanism well known, but since it isn’t in the climate models I suspect that it isn’t. The climate models and simple basic physical arguments predict, and the data verify, that temperature fluctuations tend to get magnified as you go up in the troposphere: http://pubs.giss.nasa.gov/docs/2005/2005_Santer_etal.pdf It is due to the fact that the moist adiabatic lapse rate, which temperatures in the tropics tend to at least roughly follow, is a decreasing function of the surface temperature. Joel, I do take convection into account as I indicated in a previous comment. This is how the troposphere warms, from the bottom up. If you correctly understood the role of convection, you would not be so hamstrung in your thinking that you focused so much on the surface radiative balance. The problem with much of global warming theory is that it focuses too much on radiation and too little on the physical movement of gases and liquids in the atmosphere. No…That is the problem with skeptics like yourself who don’t seem to understand when you have take convection into account and when you don’t. They (you) are constantly talking about the surface radiative balance, which is essentially irrelevant. Actual climate scientists understand that a better way to do things is to start with the top-of-the-atmosphere radiative balance because you truly don’t have to take convection into account there: There is no convection in the vacuum of space. It is often stated that greenhouse gases keep the Earth around 33 degrees warmer on average than it would otherwise be. When compared to the surface of the Moon which is the same distance from the sun this would appear to hold true. Our atmosphere is actually cooling Earths surface during sunlit hours. Part of this is due to clouds, but for the most part it is through conduction, evaporation and convection that our atmosphere cools the surface. Water vapour, a greenhouse gas capable of reflecting outgoing IR, is also part of the hydrological cycle acting as a giant vapour/condensate heat pump transporting heat away from the surface. This is well-understood by climate scientists…as can be seen in the Trenberth-Kiehl diagram. It also turns out that if you know the global precipitation (or evaporation) rate, you know to within a few percent how much heat is being transported from the surface into the atmosphere via the evaporation/condensation mechanism. It is simply a first-year physics problem. We may not have the technology to measure the budget down to the tenths of a watt per m^2 that we would like to. However, we do have the technology to accurately calculate the effect of a certain increase in greenhouse gases on that budget…and it is much easier to then work your way down to figure out what is happening at the surface than to work your way up. Convection may be complex in nature but its effect is relatively simple, which is to maintain the environmental lapse rate at something very close to the appropriate adiabatic lapse rate in the troposphere. I have demonstrated earlier on this thread that what was assumed about the impact of 15 micron LWIR on the surface of the the oceans may be a serious error. You appear to have changed your position from claiming Willis was right to saying that it does not matter and that TOA radiation budgets are what is important. The fact that you can’t even convince someone like Willis of your position shows how untenable it is! Willis is not exactly disinclined toward skeptic arguments and it is rather frustrating to me to see what a very smart guy like Willis will continue to believe. And, you are mis-characterizing my position: What I am saying is that you are not even looking at the problem correctly because you don’t understand what determines the surface temperature. Mike: Here is one example of evidence for a positive cloud feedback – http://physicsworld.com/cws/article/news/39908 Does the evidence prove that the cloud feedback is positive? No, but I am not claiming such. I am just claiming that it is not realistic to claim there is no evidence in favor of a positive cloud feedback. As for the evidence that you provided regarding the hockey stick by linking to many threads from Steve “Mountain out of Molehill” McIntyre, that hardly provides objective evidence that Mann’s work is “utterly incorrect”. At some point, you are going to have to get beyond your belief that all the accolades that Mann wins ( http://wattsupwiththat.com/2011/11/16/mann-gets-medal/ ) are just evidence that the entire scientific process is corrupt and entertain the fact that maybe you guys in your own little corner of the universe are wrong… Not that I am expecting that to happen very soon, given the power of cognitive dissonance and all. Joel Shore – Evidence??? As the AGWers love to say: correlation is not causation. If the cloud cover decreases then it is not at all surprising if the sea surface warms up. That’s all they did, compare the two – less clouds = warmer sea surface, more clouds = cooler sea surface. They have no mechanism, no evidence that elevated CO2 levels cause lower cloud cover. Incidentally, I was somewhat surprised to see that of “18 leading climate models…Only two models predicted a positive feedback“. What’s going on – 16 of 18 models don’t support their findings yet the “researchers” cherry-pick one of the two that does??? Imagine the outcry from AGWers if someone drew global conclusions adverse to AGW from a short sample of data from a small fraction of the world’s oceans that contradicted 89% of their own computer models and had no known mechanism. It’s really hard to take any of this pathetic substitution for science at all seriously. And regarding the hockey stick, instead of spouting the usual ad hominems, how about addressing the actual issue? Mann cheated, he got found out. Unless, that is, you can demonstrate that McIntyre’s work was fatally flawed. In an outstanding display of the ad hominem approach to argumentation you’ve failed to address the issue originally under discussion by changing it to me. Coming from an experienced debater such as yourself, the issuance of an ad hominem argument amounts to a tacit admission of defeat on the original issue. Joel, you mentioned the Trenberth-Kiehl diagram, I suggest you take another good look at it. That diagram makes no distinction between ocean and land with respect to the absorption of back radiated (backscattered) LWIR. I again urge you to conduct the empirical experiment I have described. You will learn that the cooling rate of water that is free to evaporatively cool is not effected to the same degree by incident LWIR as other materials. No matter how much hand waving you wish to indulge in about poorly quantified radiation budgets, the fact remains that the ability of back radiated LWIR to slow the cooling of the Earth’s surface is fundamental to the original global warming claims. The “absorbed by the atmosphere” part of the Trenberth-Kiehl diagram is rubbish with respect to CO2. CO2 molecules almost instantly re-radiate any LWIR photons they intercept. The only way that CO2 is going to warm our atmosphere is by slowing the cooling of the Earth’s surface. I have empirically demonstrated that 71% of the Earth’s surface does not respond to LWIR in the manner shown in the Trenberth-Kiehl diagram. Kevin Trenberth, as evidenced by the very diagram you mentioned, believes back radiated LWIR has an equal effect over water as it does over land. Further, he believes it has trapped heat in the oceans that strangly we can’t detect. I claim that this is not the case. If you wish to dispute my claims further, please do so through links to lab experiments involving LWIR and liquid water. Terry: This http://wattsupwiththat.com/2011/11/09/climate-sensitivity-lowering-the-ipcc-fat-tail/#comment-802864 is not ad hominem…Explaining where you are confused about the science is not ad hominem. I would say that making claims that an argument is ad hominem as a way to avoid addressing the scientific points “amounts to a tacit admission of defeat on the original issue”. Konrad: I don’t think it is useful to continue this discussion further. Your understanding of the greenhouse effect is so poor and you refuse to try to learn more about it. I am sure arguments so silly that they can’t even gain traction amongst skeptical scientists like Willis Eschenbach will be very impressive to the larger scientific community. Your ad hominem arguments are: 1) “Your post shows that you are suffering under a too simplistic view of the greenhouse effect.” (Nov. 17 at 4:22 pm) 2) “you have a very black-and-white, two-valued view of the world” (Nov. 20 at 6:16 am) and 3) “Terry: As near I can tell, it is you who are running yourself in circles” (Nov. 20 at 6:16 am). Each of these arguments makes me the issue while avoiding the issue of ambiguous reference by terms in the vernacular of climatology such as “greenhouse” and “heat.” As a portion of an argument, a term that makes ambiguous reference has the logical shortcoming of facilitating proofs of various falsehoods via its violation of the law of non-contradiction. For person of honest intent, to facilitate proofs of falsehoods has no merit. In this sense, terminology does matter. If you read the Willis post on the impact of LWIR on the oceans he claimed that LWIR impacting on the surface of water would slow the cooling of liquid water in the same manner as other materials. I proved this wrong through empirical experiment. If this is irrelevant to AGW theory, why did Willis spend so long arguing it? He ended up running away from the discussion. You appear to have done the same.